Hair Loss comes in all patterns and can be brought on by a variety of factors, some of which can be treated before you see yourself balding, while other factors, like genetics are more difficult to avoid and no amount of the best hair loss shampoo will make any difference unfortunately. Alternate forms of testosterone that inhibit hair growth. Finding a safe and powerful solutions to restore and replenish hair has been the focus of a multimillion-dollar market in the US, and all over the world. Man or woman, young or old, no one is immune.If it occurs to you, it is important to separate the facts from the myths, especially because there are plenty of unscrupulous sellers who are more than ready to take your hard-earned dollars in exchange for a product that provides minimal benefits or none at all. 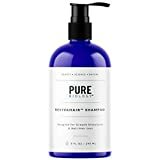 Finding the best shampoo for hair loss is the most confusing and frustrating part when trying to prevent that your thinning hair disappears completely. Now that you've landed on this post, let's try and help you ease your decision and hopefully get a treatment that suits your needs. 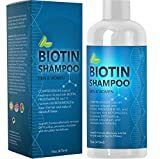 If you need to fight hair loss and assist your hair growth than you need a shampoo that contains ingredients to boost blood circulation within the scalp, such as niacin. You also want a shampoo that cleanses your scalp well, otherwise pores may get blocked and lead to eventual hair loss. Ingredients like salicylic acid aid with this. This product uses Caffeine which is one of the proven ingredients to stimulate hair follicles and reinvigorate hair texture and health. The Ultrax Labs Hair Surge Shampoo also contains Ketoconazole, which is an anti-inflammatory molecule that scientists believe prevents hair loss and saw palmetto which helps block the biochemical pathways that leads to hair loss. The recommendation on the package advises to use the Shampoo at least 5 times every week. Each time you wash your hair, you should keep the shampoo on the hair for approximately 5 minutes to get the best treatment and effect. 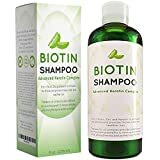 With an overall 4 star rating out of more than 5,000 customers this product is definitely one of the most sought after solution for hair growth and most customers on Amazon have left positive feedback saying that they saw the stimulating effect on their scalp hair when using it. No wonder it is also listed as one of amazon's choice products at the time of this review, with 75% of customers who left feedback giving it 5 stars. If this product is works for you, then you should see results within 4 weeks. Obviously, the more you use it, the better the chances of seeing hair growth and therefore we suggest trying it every day for a month and see how it goes for you. There are no negative side-effects of using it every day, such as drying of the scalp and the Ultrax Labs Hair Surge Caffeine Shampoo has the smell and feel of any ordinary shampoo. Pura D'Or contains Biotin to strengthen your existing Hair and Niacin to increase circulation to your Hair Follicles. It also contains Saw Palmetto, which may help block the biochemical pathway that causes hair loss. It also has Argan Oil, B Vitamins, and more ingredients. 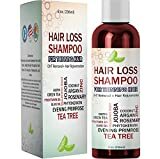 This Shampoo should ideally be left on the hair for two minutes with each wash, no wonder it was ranked as the top selling hair loss prevention shampoo on Amazon for two years in a row. In fact, many customer reviews mention that they saw a decrease in hair loss within a few weeks. To top it all off, this is an organic product, it smells good and does not contain any harmful ingredients which means that you can use it on a daily basis without issues. Check out Pura D'Or Premium Organic Shampoo details and prices here. Phytoworx Organic Hair Loss Shampoo is also made up of active organic ingredients, and uses stem cells and ingredients derived from rare plants found in Switzerland, apart from other natural ingredients such as Eucalyptus Oil and Peppermint which stimulate the scalp and therefore reverse hair loss. An added advantage of this Anti-Hair Loss Shampoo is that it doesn't contain sulfates and therefore should not cause any scalp irritation, dryness or dandruff. A good number of consumers who have used Phytoworx Organic Hair Loss Shampoo are satisfied with this product, claiming to see results within a few weeks. This shampoo helps thicken the hair by stimulating new growth. Some consumers recommend mixing it with other types of shampoo or conditioners to create a better lather. Now that you've seen what we recommend, maybe you would like to see what the market is choosing to buy. 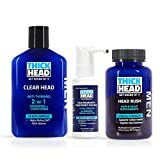 Unfortunately we do not have the stats for the whole market, however we do have the Amazon top sellers which is updated regularly and indicates which anti-hair loss shampoos are best sellers on Amazon. Given the enormous number of customers that purchase from this site we think it's a reasonable indication of what other people are finding useful. 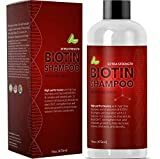 So, listed below are Amazon's ten best selling Shampoos for preventing hair loss. - Contains vital nutrients that significantly promote the regrowth of stronger, thicker and healthier hair. HAIR REGROWTH TREATMENT: FDA-approved 5% Minoxidil reactivates dormant hair follicles to help regrow hair. HAIR & SCALP SUPPLEMENTS: Our formula addresses nutritional deficiencies and helps promote a foundation for healthy, fast growing and longer hair. To start with, we would suggest a Hair Loss Shampoo that is free of harmful chemicals, such as Para﻿bens and Sulphates. These will tend to do more harm than good to your hair. Now, do you know what is your hair type and scalp type? You need to answer these basic questions if you want to have a chance of fighting off hair loss. Even though these shampoos are created with the main purposes of reducing hair-loss and stimulate re-growth, each shampoo on the market will be tailored for the different types of hair and scalp. In most cases you will therefore have to choose between one made for Dry Scalp and Hair, from one for Oily Hair and Scalp, for example. We've given you a list of our favorite makes and brands of shampoos and we also included the top-sellers. If you want to try one which is not included in any of our lists above, then make sure you go for reputable and proven brands and do your research carefully. There are many sellers which claim and promise excellent results but which unfortunately do not deliver. For these shampoos to work, the ingredients in the shampoo must be properly absorbed by the scalp. For this reason it is important that every time you are applying these hair re-growth shampoos you leave them on your scalp and hair for a few minutes to allow the scalp to absorb the essential nutrients within the shampoo. Many people apply them like any normal shampoo and rinse it off too quickly. The instructions on the shampoo will guide you on how best to use it and therefore make sure to read them carefully before using it, especially how long you have to keep the shampoo on your hair before rinsing it off. You probably don’t think about it much until you start to lose it. When it comes to hair, sadly, that’s just the way it is. You will not appreciate your hair until you see it go down the drain. Utilize the tips contained in this article to save your hair. Here’s an idea for those battling hair loss. Most people feel that a haircut that is well trimmed can be very appealing and attractive; this is especially the case if you starting to bald. Keep your hair short and well groomed. You may also find this to be an easy way to look your very best! When you find you are suffering from an illness, you must take especially good care of yourself. If your body isn’t properly taken care of by taking the medication that is prescribed to you, or you don’t do the things that your doctor told you to do, then your body will be forced to work even harder to mend itself. It takes energy to grow hair, and if you are forcing your body to burn up all its energy merely to stay alive, you cannot expect to grow hair! When your body cannot keep new follicles growing, you will experience the loss of hair. To avoid hair loss, try not to overuse styling products. Some styling products, products like hairspray and styling gels, can severely damage your hair and actually accelerate hair loss. Your Diet can also be an important Factor to consider. Eating white sesame seeds can help slow down hair loss. Eat some white colored sesame seeds every morning. These healthy seeds contain a large amount of magnesium and calcium. Magnesium and calcium have been shown to help reduce the loss of hair and actually nourish your scalp. You may wish to add more Vitamin C to your diet if you notice hair loss. Vitamin C helps get the blood flowing to the hair follicles by maintaining capillaries, allowing more blood to get to the scalp. Increased flow of the blood to the scalp, will speed up hair growth. If you are on anti-depressant medication, be careful of losing your hair. Many people find that these and other prescription medications contain ingredients which can trigger hair loss. Ask your doctor about this side effect, and whether a different medication may be appropriate. Try massaging your scalp as much as you can to stimulate nerves and circulation. Massage has been shown to be effective for stimulating hair growth, as it releases tension and stress that could be the cause of premature hair thinning. You can try this every day without any risk at all. Some people find aloe vera to be effective for the loss of hair prevention. All you need to do is rub a bit of the substance into the scalp on a nightly basis prior to going to bed. Aloe vera contains minerals that nourish your hair, making it stronger. Also, massaging it into your scalp will stimulate the hair follicles, reducing hair loss. Look for reasons that may have contributed to your blading. Losing your hair could have something to do with a medicine you’re taking, or even something traumatic that has gone on in your life. If you are able to find the cause of hair thinning, you could possibly stop it. Some documented causes of short term hair loss include anemia, illness, operations, stress and extreme changes in weight. This temporary the loss of hair often starts 3 months after an event ends, and usually lasts about 3 months in total. Keep this in mind and use this information to design a good treatment. Nearly two of three males wind up suffering a form of hair thinning in or after their twenties, so all men should be ready for it. DHT, produced by testosterone, destroys hair, so precautions must be taken to minimize hair loss risks. If you are losing your hair, it may be helpful to think back and identify the general time frame in which you first noticed the problem. There are those that may have began losing hair early when they switched to a specific product or gel for their hair. Stopping use of the source product could actually solve the hair loss, but without paying attention, it could continue to worsen without ever knowing the real cause. Minimizing your exposure to toxins and other pollutants can keep your hair healthy and lush. Harmful substances that find their way inside your body make you less healthy, and as your body struggles to stay healthy, this can have an adverse affect on your hair and contribute to its loss. For example, you do not want to be near unhealthy traffic fumes or whenever you are dealing with toxic chemicals, gloves should always be worn. You do not have to live with the loss of hair anymore. Finding out how to regrow it is priceless. Be sure to apply what you have read via the tips above, and you can begin today. Hopefully, you will see a difference on that scalp in the immediate future. Weight loss or gain, stress, some illnesses, surgery, and other conditions can cause temporary hair loss. This temporary loss of hair usually starts three months after a certain event, and lasts about three months as well. It is important that you are aware of the different circumstances that can cause temporary hair thinning. When addressing hair loss, it’s vital that you are aware on the ways you fix your hair. Some practices that are known to lead in the result of hair thinning are wearing constricting devices, tight pony tails, and barrettes. The reason that you will lose hair this way is known as traction alopecia. As the introduction said, men and women, both young and old, suffer from hair thinning. Blading may be caused by factors that you control, as well as factors you don’t control. This article provides you with many hints and tips that you can use to determine the cause of your hair loss and treat it accordingly. Hi I'm Vincent, the editor of this website. I consider male grooming as a lifestyle choice. If you're comfortable with letting mother nature take care of your looks, then that's cool, however for those of you who want to make sure they look their best, I provide guides and tips for your male grooming needs.